Skeese Greets: What's Your Vice? It's Ash Wednesday, which means it's the first day of Lent in Western Christianity. For 40 days, Catholics and many others will give up a vice. But come Easter Sunday, they can once again partake in chocolate, alcohol, sugar, or whatever else they gave up. If you grew up in South Texas, as I did, you'll also be subjected to "Fish Fridays" in the school cafeteria - yuck! I always knew that the practice had something to do with Lent, but I didn't know the reasoning behind it until now. In ancient times, meat was considered a luxury food; only people who could afford to buy it in the market or have enough land to raise cattle were able to eat it. Fish, however, could be caught in the stream by anyone and vegetables could be grown or foraged by anyone. These foods did not require money. Therefore fish was considered a poor man's food and meat was a rich man's food. That's why the most common form of fasting is to give up meat and eat fish instead. I think I'll still pass on the fried fish fillets...I'll take any veggies in place of that! 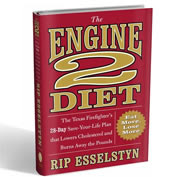 If you're looking to substitute the meat products during this season of Lent, check out the new book by my friend Rip Esselstyn called the Engine 2 Diet. It's all vegan. Or another great book is "Quick & Easy Recipes for Active People" by my friend Meredith Terranova. There's a great salmon recipe in there. What's your vice? And are you giving it up for the next 40 days? If so, good luck! Quote of the Day: “Nothing is as certain as that the vices of leisure are gotten rid of by being busy.” Seneca (5 BC - 65 AD), Moral Letters to Lucilius, 64 A.D.